There's no light like it. The most vivid, saturated color palette available. A contrast ratio unsurpassed by the best film and video technologies. The ability to reach out in three dimensions and shower an audience with cascades of beams or embrace them in waves of moving light. • It's about enchanting an audience with dreamlike visions. • It's about exciting crowds with visual effects that move faster than any other light-form. • It's about engaging clients and customers with captivating images that move with a unique animation style. The most spectacular laser effect is audience scanning. As shown at the top of the page, beams and laser patterns are scanned directly into the audience area. When knowledgeable firms are involved, with proper equipment & monitoring, and following government regulations, these shows are perfectly safe to view. What does direct audience scanning look like? All around you — and sometimes even on you — are moving beams and shapes of light. They all move in time to the music, whether slow and subtle or fast and furious. The result has been compared to being inside a fireworks show as it goes off. Unlike most other media, which occur far from the audience and are passively enjoyed, audience scanning beams actually reach out and touch the audience. This provides a much stronger emotional link between artist and audience. The primary advantage of laser light is that it truly is a unique high-tech lighting source, not normally seen by the average person. This makes lasers perfect for special applications and events. There are two main types of laser displays: beams and graphics. 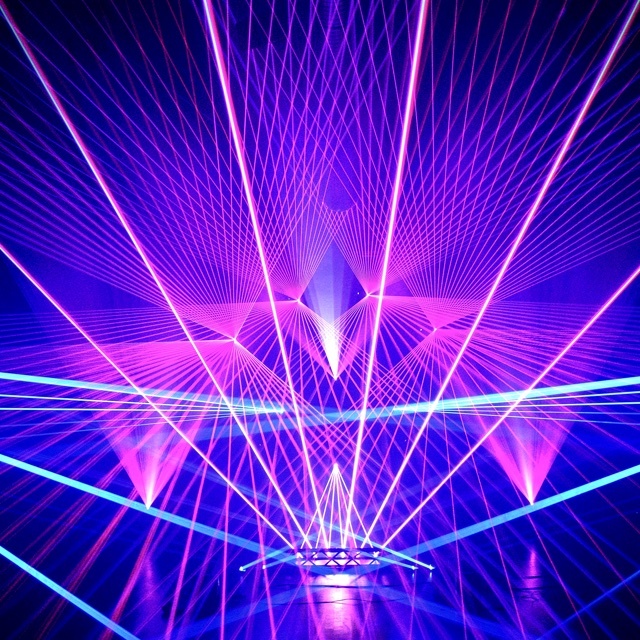 For beam shows, the laser light is seen in mid-air, either as glowing beams or scanned to create simple shapes such as cones and planes of light. From just one laser projector, beams can be targeted to dozens of mirrors, producing a “Star Wars” effect of laser beams shooting throughout the room in different directions. Add more projectors, and the audience is captivated by the amazing array of seemingly-solid beams. 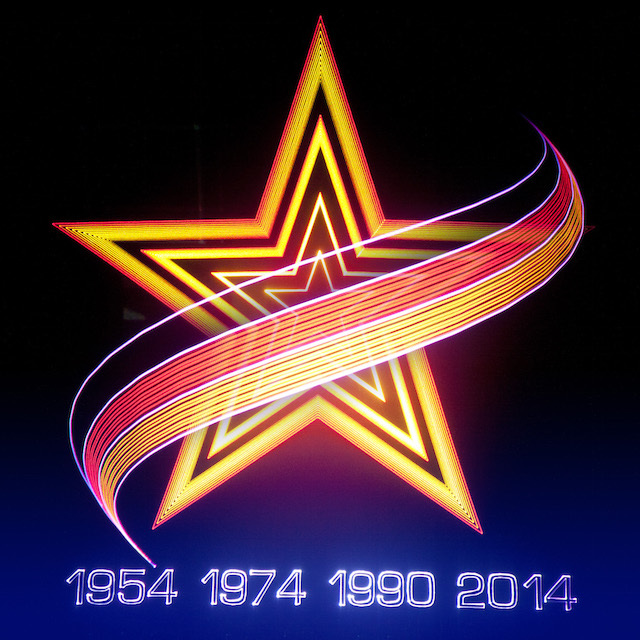 Laser graphics are projected onto a wall, building, or other surface. The tiny dot made by the laser beam is moved quickly by computer-controlled mirrors, to draw out images, text and logos. Because the laser is so powerful, the graphics can be projected onto even the largest of surfaces such as a dam or mountain. 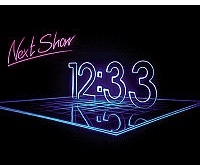 There are a number of different ways to make the laser graphics, as shown below. Outline drawings entered using a digitizer, and animated by hand or with computer assistance. Recent advances in software allow standard computer 3D drawing programs (3ds max, Flash) to be converted into laser-projected graphics. 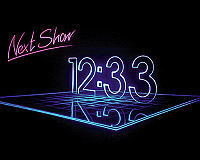 TV-like raster drawings, using lines of laser light with changing colors to do patterns and photos. 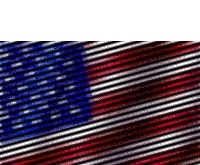 Unlike conventional TV, the underlying raster pattern can be varying shapes -- not just horizontal lines but diagonal (as shown at right) vertical, spiral and other shapes. Flowing, psychedlic abstracts. 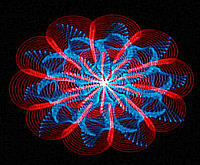 The very first planetarium shows, in the pre-computer era, mixed electronic waveforms of varying shapes, frequencies and amplitudes to create mesmerizing oscilloscope-like abstract patterns. The unique look of these images is still popular today. 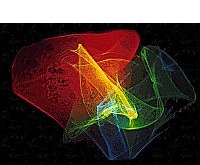 Laser lumia (distorted/refracted light) created by projecting through various substances. Textured glass produces gauzy laser clouds with an unearthly overlay of dark parallel lines. A laser through a cut crystal ball sends "stars" around the room. Holographic diffraction grating produces regular patterns of dots. Outline drawings entered using a digitizer, and animated by hand or with computer assistance. Recent advances in software allow standard computer 3D drawing programs such as 3ds max or Animate 4D to be converted into laser-projected graphics. TV-like raster drawings, using lines of laser light with changing colors to do patterns and photos. Unlike conventional TV, the underlying raster pattern can be varying shapes -- not just horizontal lines but diagonal (as shown here) vertical, spiral and other shapes. Here at ILDA, our Members use laser light directly, to create mid-air or audience-scanning beam effects. Our Members also can draw graphics that — while they aren’t as detailed as laser-illuminated projectors — have a unique “look” all their own. Audiences are used to big-screen TVs and movies; but these laser light show displays are very different from conventional lighting and projected images. It is also possible to use a laser as the light source to project digital video and motion pictures. Lasers can make the image brighter and more colorful, compared to non-laser bulbs. The end result of this type of projector is simply an improved TV or movie image. It is NOT what ILDA Members use for creating laser light shows. For more information on laser-illuminated projectors, visit the Laser Illuminated Projector Association website.